Maryland is proving to be one of the states in the union that is most advanced in its efforts to move utility treatment of solar energy, EVs, and other distributed energy resources toward a “customer-centric” universe. Maryland Public Service Commission hearings on energy storage, one element of a six-pronged review of DER, are scheduled to begin March 13. The overall PSC effort is “to explore issues that will maximize benefits and choice to Maryland electric customers and, in particular, assess how the evolving electric grid impacts low- and moderate-income ratepayers,” the PC44 proceeding reads. One conclusion of a PSC-ordered study of the value of solar in Maryland is that Maryland could cost-effectively add 140 gigawatts of solar combining behind-the-meter (BTM) and utility installations, according to Daymark Energy Advisors. One of the six working groups that the PSC set up in its investigation of distributed energy resources (DER) was the Energy Storage Working Group. In January, the group presented a proof of regulatory concept program proposal that proposes a three-year set of four pilot programs to test for the best model for statewide adoption. “The PC 44 Energy Storage Working Group appreciates this opportunity to propose to the Commission a Proof of Regulatory Concept Program to explore considerations for energy storage as a resource for customers and as a distribution grid asset,” the group said. “The consensus of this Energy Storage Working Group is to adopt a learning-by-doing approach, whereby the utilities will solicit four commercial and regulatory models, to evaluate the efficacy of energy storage assets under multiple application and ownership models,” the group described. “Over a three-year period, the Energy Storage Working Group’s proposed program is intended to successfully test innovative commercial structures that enable multiple parties to tap resources across several value streams, including retail and wholesale markets,” the group explained. The test models range from utility-owned storage, to third-party involvement with the utility, to a virtual power plant model using an energy aggregator. The test pilot projects will include each of the four investor-owned utilities (IOUs), each of which will solicit offers from market participants for all four proposed models and submit applications for a minimum of two proposed energy storage projects that employ at least two of the four models described in the report. The total program size will be between 5 and 10 megawatts cumulatively across the four electric service territories (with a minimum of 15 megawatt hours), the working group instructed. 1. Drive energy storage projects and applications that provide value for ratepayers. 2. Deploy projects and enhance learnings that facilitate grid reliability. 3. Inform the regulatory process and maximize learnings across stakeholders. 1: Test the efficacy of various business models and applications to facilitate storage participation in multiple value streams and multiple ownership structures. 2: Identify if any of the models can provide cost-effective grid alternatives to system needs and societal benefits. 3: Acquire a better understanding of the regulatory, economic and technological aspects of storage projects through a learning-by-doing process, to improve the process for deployment of energy storage systems in the future and to drive down certain costs. Apart from energy storage, the PSC set up working groups to study Rate Design, Electric Vehicles, Competitive Markets and Customer Choice, the Interconnection Process and Distribution System Planning. The PSC also hired the Daymark Energy Advisors to analyze the value of solar energy in the state; a draft report was issued in April 2018 and hearings are now scheduled on this report for April 23. The Daymark value of solar report covered the businesses of Baltimore Gas & Electric (BGE), Delmarva Power & Light (DPL), Potomac Electric Power Company (PEPCO), and Potomac Edison (PE). The report also worked with the Maryland Energy Administration and the Office of Peoples Counsel, within the government. Non-governmental agencies contributing to the report included Vote Solar, the Pace Energy and Climate Center, and the Maryland, DC, and Virginia Solar Energy Industries Association. Daymark found that solar holds great value for the state, and in particular for utilities using it to avoid new infrastructure expenditures. 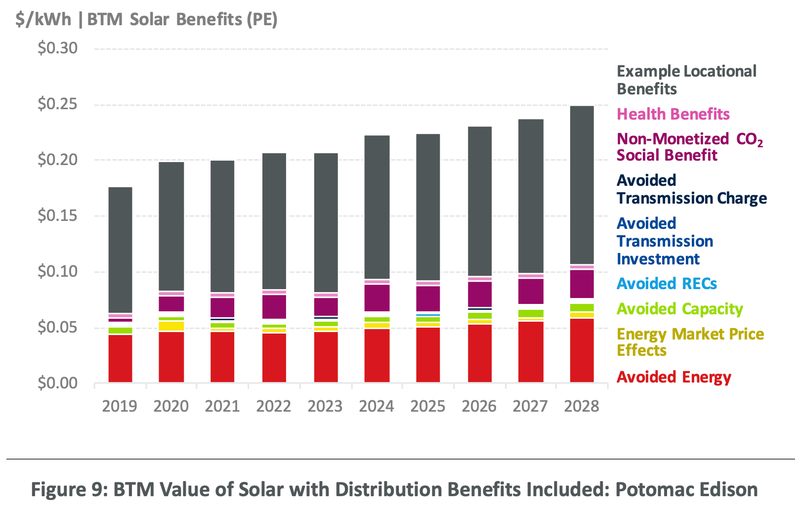 “For example, a 2 MW (solar) project that avoids a $2 Million distribution investment, could add $0.11/kWh in additional locational benefits,” the report stated, among many other conclusions. Such a locational-assessment of solar value also is now underway in California and other states leading in DER regulation.